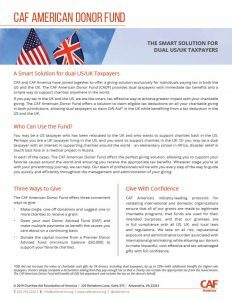 CAF and CAF America have joined together to offer a giving solution exclusively for individuals paying tax in both the US and the UK. The CAF American Donor Fund (CADF) provides dual taxpayers with immediate tax benefits and a simple way to support charities anywhere in the world. If you pay tax in the UK and the US, we are the smart, tax-effective way to achieve greater impact with your charitable giving. The CAF American Donor Fund offers a solution to claim eligible tax deductions on all your charitable giving in both jurisdictions, allowing dual taxpayers to claim Gift Aid* in the UK while still benefiting from a tax deduction in the US. WHO CAN USE THE FUND? You may be a US taxpayer who has been relocated to the UK and who wants to support charities back in the US. Perhaps you are a UK taxpayer living in the US, and you want to support charities in the UK. Or you may be a dual taxpayer with an interest in supporting charities around the world – an elementary school in Africa, disaster relief in South East Asia or a medical project in Russia. In each of the cases, The CAF American Donor Fund offers the perfect giving solution, allowing you to support your favorite causes around the world and ensuring you receive the appropriate tax benefits. Whatever stage you’re at with your philanthropy journey, we can help. Our team of professionals will be with you every step of the way to guide you quickly and efficiently throughout the management and administration of your giving. The CAF American Donor Fund offers three convenient ways to give. CAF America’s industry-leading protocols for validating international and domestic organizations ensure that all of our grants are made to legitimate charitable programs, that funds are used for their intended purposes, and that our grantees are in full compliance with all US, UK, and local laws and regulations. We take on all risk, reputational exposure and administrative burden associated with international grantmaking, while allowing our donors to make impactful, cost-effective and tax-advantaged gifts with full confidence. The CAF American Donor Fund is managed in the UK and wholly owned by CAF America, a US 501(c) (3) public charity, and part of CAF’s international network of charities. As a result, donations to the fund are classed as gifts to a US public charity. This means they qualify for a tax deduction in the US as well as Gift Aid benefits in the UK. You can suggest that your gift be distributed to charities or charitable causes anywhere in the world, with CAF providing extensive due diligence to ensure that the charity is eligible for charitable tax relief in both countries. Gifts to the CAF American Donor Fund can be made by cash or check, gifts of quoted securities and shares, through UK payroll giving, and via legacy donations. Gifts can be sent via wire transfer and are accepted in multiple currencies. Our philanthropy advisory team are committed to helping you achieve more effective philanthropy with values-based giving. Through the CAF American Donor Fund, you can also take advantage of an array of fee-based advisory services, including grantmaking advice, research, and more. *Gift Aid can increase the value of charitable cash gifts by UK donors, including dual taxpayers, by up to 25%—with additional benefits for higher-rate taxpayers. Donors simply complete a declaration stating that they pay enough tax so that a charity can reclaim the appropriate tax from the Government. The CAF American Donor Fund will handle all Gift Aid paperwork and reclaim the tax on the donor’s behalf. PODCAST: Latest from the IRS: Is the Landscape of International Philanthropy Changing?